A record-breaking 31-metre-high ice tower has been installed at the annual winter festival in Harbin, China, featuring a shape inspired by the flounces of a flamenco dancer's dress. Students from Eindhoven University of Technology (TU/e) and Summa College, both from the Netherlands, and the Harbin Institute of Technology (HIT) worked together to build the tower for the Harbin International Ice and Snow Sculpture Festival. It is significantly taller than the 21-metre-high tower created at the fair in 2015 – it is now being recognised as the tallest ice tower ever built. 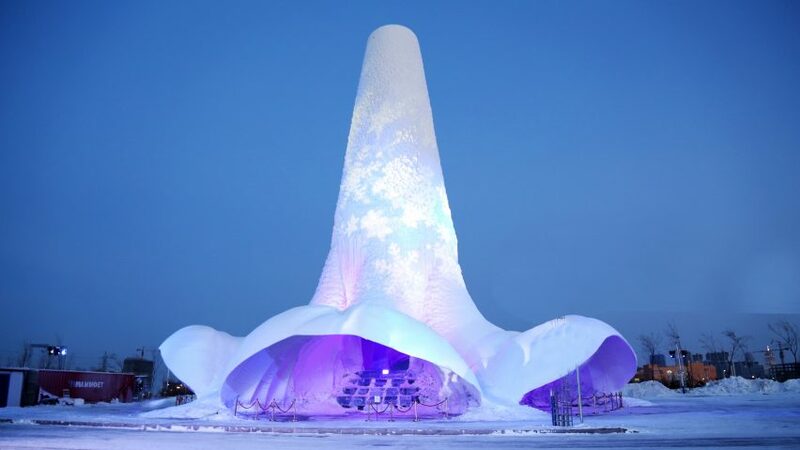 The frozen frills and hollow cone-shaped tower were formed using icy water impregnated with cellulose fibres, which was sprayed in layers over an inflatable structure. The design team spent two years perfecting this technique, which included building a prototype model on the HIT campus last winter. The fibre-reinforced ice is three times stronger than pure ice, allowing for a thinner structure and greater spans, as well as a faster application process. Once the ice layers are complete, the inflatable is removed, leaving behind a shell that is 25 centimetres thick on average. Because the construction method requires only water, naturally occurring fibres and low temperatures, the structure is highly sustainable and fully recyclable. When spring arrives, it will melt away without a trace. They team hope the technology could be applied to building temporary structures in other cold places, "or even Mars missions". The hollow central tower is supported by six cantilevered legs, which open out under the swooping canopies to form entry points. Visitors can climb carved ice-block steps up to a central platform, where they can look up under the arches into the cathedral-like dome. Lights and patterns are projected on to the translucent ice at night, referencing traditional Chinese paper lanterns. These lights scatter snowflakes on the exterior, making the tower glow from within. Harbin is famed for its annual winter festival, a month-long event every January that holds competitions for the world's largest ice sculptures. Located in northeastern China, where cold winds rush down from Siberia, the city experiences extreme temperatures of minus 16 degrees Celsius in winter, sometimes dipping to as low as minus 35. In recent years, the city has opened new buildings to cater to the throngs of tourists who flock to the city for the festival. These include two buildings by Beijing studio MAD – an opera house with a sinuous form, and a museum dedicated to wooden sculptures. The ice festival continues until the end of February 2017. The designers plan to follow up the festival by creating more ice sculptures, coinciding with the 2022 Winter Olympics in Beijing.